As we were hanging out recently, the idea came to us at the lab to create memes in order to summarize our work. We should be writing articles but hey, we needed the break, and so we shared them with each other in our last group meeting along with a good laugh. Here are some of the funniest ones. A fail safe method for Comp. Chem. Try your own and share. Thanks for reading. #CompChem – Can Orbitals Be Directly Observed? Communication of scientific findings is an essential skill for any scientist, yet it’s one of those things some students are reluctant to do partially because of the infamous blank page scare. Once they are confronted to writing their thesis or papers they make some common mistakes like for instance not thinking who their audience is or not adhering to the main points. One of the the highest form of communication, believe it or not, is gossip, because gossip goes straight to the point, is juicy (i.e. interesting) and seldom needs contextualization i.e. you deliver it just to the right audience (that’s why gossiping about friends to your relatives is almost never fun) and you do it at the right time (that’s the difference between gossips and anecdotes). Therefore, I tell my students to write as if they were gossiping; treat your research in a good narrative way, because a poor narrative can make your results be overlooked. I’ve read too many theses in which conclusions are about how well the methods work, and unless your thesis has to do with developing a new method, that is a terrible mistake. Methods work well, that is why they are established methods. Take the following example for a piece of gossip: Say you are in a committed monogamous relationship and you have the feeling your significant other is cheating on you. This is your hypothesis. This hypothesis is supported by their strange behavior, that would be the evidence supporting your hypothesis; but be careful because there could also be anecdotal evidence which isn’t significant to your own as in the spouse of a friend had this behavior when cheating ergo mine is cheating too. The use of anecdotal evidence to support a hypothesis should be avoided like the plague. Then, you need an experimental setup to prove, or even better disprove, your hypothesis. To that end you could hack into your better half’s email, have them followed either by yourself or a third party, confronting their friends, snooping their phone, just basically about anything that might give you some information. This is the core of your research: your data. But data is meaningless without a conclusion, some people think data should speak for itself and let each reader come up with their own conclusions so they don’t get biased by your own vision and while there is some truth to that, your data makes sense in a context that you helped develop so providing your own conclusions is needed or we aren’t scientists but stamp collectors. This is when most students make a terrible mistake because here is where gossip skills come in handy: When asked by friends (peers) what was it that you found out, most students will try to convince them that they knew the best algorithms for hacking a phone or that they were super conspicuous when following their partners or even how important was the new method for installing a third party app on their phones to have a text message sent every time their phone when outside a certain area, and yeah, by the way, I found them in bed together. Ultimately their question is left unanswered and the true conclusion lies buried in a lengthy boring description of the work performed; remember, you performed all that work to reach an ultimate goal not just for the sake of performing it. Writers say that every sentence in a book should either move the story forward or show character; in the same way, every section of your scientific written piece should help make the point of your research, keep the why and the what distinct from the how, and don’t be afraid about treating your research as the best piece of gossip you’ve had in years because if you are a science student it is. In a nutshell, computational chemistry models are about depicting, reproducing and predicting the electronic-based molecular reality. I had this conversation with my students last week and at some point I drew a parallel between them and art in terms of how such reality is approached. Prehistoric wall paintings depict a coarse aspect of reality without any detail but nevertheless we can draw some conclusions from the images. In the most sophisticated of these images, the cave paintings in Altamira, we can discern a bison, or could it be a bull? but definitely not a giraffe nor a whale, most in the same way Hückel´s method provides an ad hoc picture of π electron density without any regard of the σ portion of the electron density or the conformational possibilities (s-cis and s-trans 1,3-butadiene have the same Hückel description). More sophisticated semi-empirical Hamiltonians like PM3 or PM6 have better parametrizations and hence yield better results. We are still replacing a lot of information for experimental or adjusted parameters but we still cannot truly adopt it as truthful. Take this pre-medieval painting of one of the first Kings of England, Aelred the Unready. It is, by today standards, a good children´s drawing and not a royal portrait, we now see more detail and can discern many more features yielding a better description of a human figure than those found in Altamira or Egypt. HF is the simplest of ab initio methods, meaning that no experimental results or adjustable parameters are introduced. Even more so, from the HF equations for a multi-electron system that complies with Pauli’s exclusion principle the exchange operator arises as a new quantum feature of matter with no classical analogue. Still, there are some shortcomings. Correlation energy is disregarded and most results vary according to the basis set employed. Take the impressionist movement, specially in France: In Monet´s Lady with Umbrella we have a more complicated composition, we observe many more features and although we have a better description of color composition some details, like her face, remain obscure. The impressionists are characterized by their broad strokes, the thicker the strokes the harder it is to observe details similar to what happens in HF when we change from a small to a large basis set, respectively. Woman with a parasol – Her face or the identity of the flowers at her feet are indistinguishable yet we might be safe to say its springtime. Extension of HF to a multi-reference method yields better results. In CI we take the original guess wavefunction -as expressed through a Slater Determinant- and extend it with one or many more wavefunctions; thus a linear combination of Slater Determinants gives rise to a broader description of the ground state because other electronic configurations are involved to include more details like the ionic and covalent pictures (configurations). The more terms we include the more real the results feel. If we take classical figurative paintings we have a similar result; most of these paintings are constituted of many elements and the more realistically each element is captured the more real the whole composition looks even if some are just merely indicated. In Edwards Much’s the scream, we might think we have lost some information again and went back to impressionism but we know this is actually an expressionist painting; we can now not only observe details of the figurative portion of the image but Munch has captured his subject´s fear in the form of distorsions on the subjective reality. In this way, CCSD(T), full-CI and CASPT2 methods provide a description of the ground as well as the excited states which -in experimental reality- are only accessed through a perturbation of the elecron density by electromagnetic radiation. Something resembling radiation has perturbated the subject in The Scream rendering him frightened and wondering how to return to his ground state or if such thing will be even possible. The Scream by Edward Munch – what sort of perturbation got this guy’s fears out? At least due to its widespread use, DFT has risen as the preferred method. One of the reasons behind its success is the reduced computing time when compared to previous ab initio methods. So DFT is pretty much like photography, in which reality is captured in full but only apparently after selecting a given lens, an exposition, a filter, shutter speed and the occasional Photoshop for correcting issues such as aliasing. In photography, as in DFT, all details concerning the procedure or method for capturing an uncanny reproduction of reality must be stated in every case for reproduction purposes. Now, in the end it all comes down to Magritte’s Pipe. Ceci n’est pas une pipe -or, ‘this is not a pipe’- reminds us that painting as with modeling we don’t get reality but rather a depiction of it. In this famous painting we look at an image that in our heads resembles that of a pipe but we cannot grab it, fill it with tobacco and smoke it. The image above is a digital file, which translated becomes a scaled reproduction of an image painted by Magritte in which we see the 2D projection of the image of an object that reminds us of a pipe. In fact, the real name of this work is The Treachery of Images, definitely quite an epistemology problem on perception and knowledge but before I get too metaphysical I should finish this post. Can you find where cubism or surrealism should be placed? with MPn methods, perhaps? Pauli’s Exclusion Principle is a paramount concept in Quantum Mechanics which has implications from statistical mechanics to quantum chemistry, consequently, there are many different statements to summarize it depending on the forum. I occasionally joke with my students about how we learnt it in kindergarten an how we state it now at the end of our computational chemistry course. 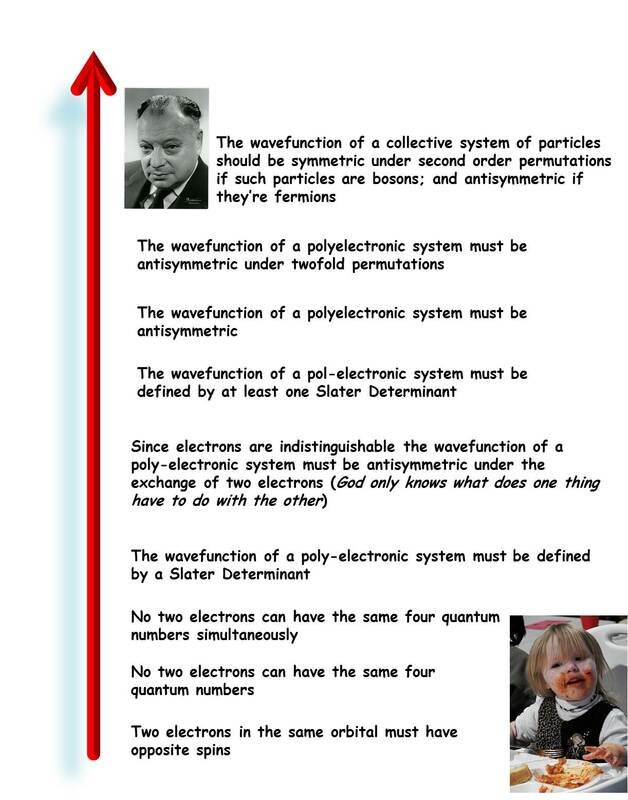 So, are you a toddler or high up there with W. Pauli predicting the existence of sub-atomic particles at CERN? Which statement of Pauli’s Exclusion Principle sounds more familiar to you? LOL just feeling a little humorous this morning!